It is totally possible that there is a gathering place for lost socks, a place where they all go and laugh at the humans who are searching the laundry room, talking about a sock-stealing monster. If you don’t think that’s a possibility, where do you find missing socks? Maybe if you were to write a book called “How to Find Missing Socks,” you could make your fortune and retire early. In the meantime, let’s explore the most likely places to find missing socks. Eaten By the Washing Machine: Okay, the washer doesn’t really eat your socks, but it is at the top of the list of where to find missing socks. There is a gap at the bottom of the agitator on most washers. The agitator is the middle part of the washer that looks like a plane propeller. It is possible for loose socks to slide into the gap and wrap around the supports. You can remove the agitator on most models by unscrewing one nut and bolt, lifting it out, and retrieving your renegade socks. Victims of Static Cling: If you have ever done laundry, you have probably experienced the joy of static cling. The assorted materials that socks are made of seem to cling to other laundry pretty easily. As you are contemplating where to find missing socks, shake out your laundry before folding it and putting it away. You may take a sweater out of your drawer that you haven’t worn since last winter and find a sock stuck to the sleeve. Try using a good fabric softener when doing laundry and you can cut down on static cling. In Dresser Drawers: Why would you find missing socks in a dresser drawer? That sounds like a ridiculous answer. If they are in your dresser, then they aren’t lost. But they probably aren’t in your dresser drawer. Many missing socks end up in some other laundry pile by mistake or due to the static cling we mentioned earlier. Under or Behind: Socks are small and wily creatures. They can hide in tight spaces without much effort. 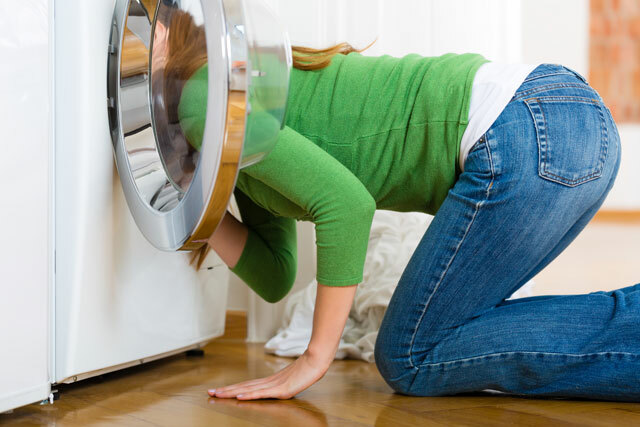 If you are looking for the mate to your favorite pair of socks, look under or behind the washer and dryer. As a matter of fact, while you are searching, under and behind the bed seems to be another excellent hiding spot. In the Dog House (or the Cat Bed): Pets are notorious for stealing things that belong to their owners. They may take comfort in having something that belongs to you, or they may be in the market for a new toy. Either way, check their usual hiding places and you just might find missing socks in their treasure trove. The questions of where socks go and how to find missing socks are ages old. The real mysteries may never be solved, but now you have a few ideas that you can try. It might make more sense to use a lingerie bag to keep your socks corralled, so they can’t escape. It won’t solve the problem, but maybe it will lessen the severity.